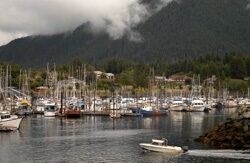 Sitka is thought to be the most beautiful of southeast Alaska cities with population of about 9,000. Nestled on the west side of Baranof Island, it is flanked on the east by majestic snow-capped mountains, and on the west by the Pacific Ocean. Sitka is the only Inside Passage community that fronts the Pacific Ocean, hugging Baranof Island’s west shore in the shadow of the impressive Mount Edgecumbe, a dormant volcano with a graceful cone reminiscent of Japan’s Mount Fuji. Sitka, Alaska is famous for its spectacular scenery, abundant wildlife, and culturally rich history and community, including twenty-two places on the National Register of Historic Places. Although first inhabited by Native Tlingit Indians, Sitka is recognized as the heart of the Russian influence in Alaska. This is one of the best Inside Passage towns to explore on foot, with St. Michael’s Cathedral, Sheldon Jackson Museum, Castle Hill, Sitka National Historical Park, and the Alaska Raptor Center topping the must-see list. Sitka is also a popular port of call for many cruise ships that sail the Inside Passage from May through September. The anchorage for large cruise ships is off shore, and smaller boats are used to tender passengers ashore to the Crescent Harbor Lightering Facility (near the Centennial Hall) or the O’Connell Bridge Lightering Facility (at the foot of Castle Hill).